The Jubilee Park in Tamale will come alive on Saturday November 10, 2018 as MTN Pulse Invasion concert provides quality entertainment. Dubbed “MTN Pulse Invasion”, the event will see performances from award-winning Tamale serial hitmaker Fancy Gadam and Flowking Stone. The Free Concert will see Fancy Gadam perform several of his hit songs like Total Cheat, Baby, Mon’Miya, Yaka Chana among others. The night will also see high rated Tamale based DJ’s and MC’S who have rehearsed to make patrons have a party before, during and after the performances. 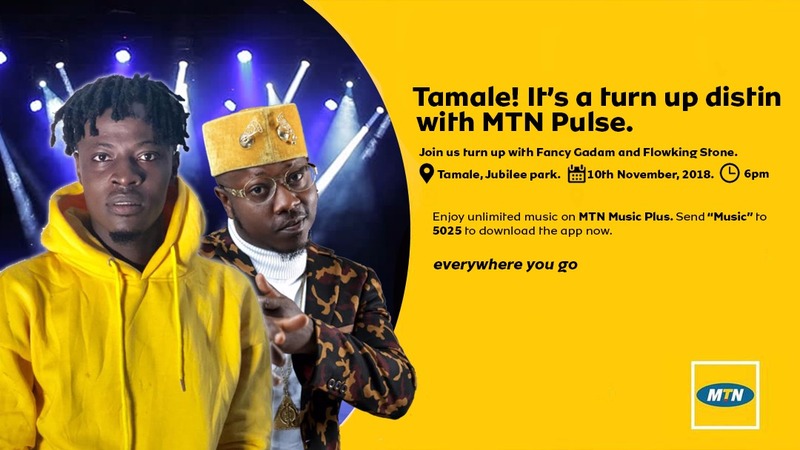 The organizers are promising a great and never experienced Jam and urging all people around Tamale to just download the MTN Pulse app to get all the backstage and VIP Treatment to the concert. MTN PULSE is a community, a lifestyle that enables you to enjoy Money-can’t-buy experiences on MTN. MTN PULSE has designed exclusive value offers for the Youth and Young at heart. MTN PULSE is for young prepaid customers on MTN and other networks. Simply Dial *567# and follow the prompts. You will receive a confirmation message from MTN PULSE (567) when your subscription is successful. To de-activate send STOP to “567”.